Friday 2/21/2014, Apple released security update IOS 7.0.6 for its iPhone, iPad and iPod devices to fix a vulnerability which allows an attacker to capture and modify secure web traffic from the devices. Have you fixed your device yet? Friday 2/21/2014, Apple released security update iOS 7.0.6 for its iPhone, iPad and iPod devices to fix a vulnerability which allowed an attacker to capture and modify secure web traffic from the devices. Yeah, not good. The update is available from your device via Settings –> General –> Software Update on iPhone 4 and later, iPod Touch (5th Gen) and iPad 2 or later. 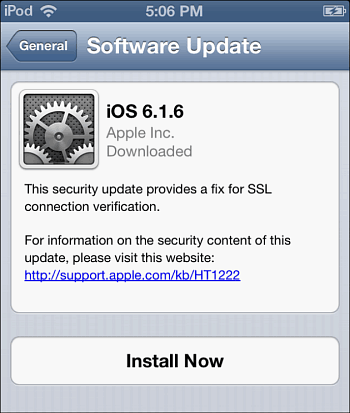 Apple also released iOS 6.1.6 for the iPhone 3GS and iPod touch (4th Gen) devices. So if you still have a device make sure to get it updated as well. So… are you updated yet? It’s also worth noting that Apple sill hasn’t fixed the SSL security hole in OS X. But check out our article: How to Protect Yourself from the SSL Security Hole in OS X.
I haven’t updated either because my phone is jailbroken too. Are you saying you think you can update and then use Evasi0n 7 and rejailbreak successfully or that the Evasi0n 7 jailbreak already takes care of the security hole?